A tweet from the club’s official Twitter account confirmed the news. Evra's future at the club was in doubt, with United continually linked with Saints left-back Luke Shaw. PATRICE EVRA ENDED speculation that he was set to leave Manchester United by signing a one-year contract extension with the Premier League club on Friday. France left-back Evra was reportedly considering quitting United after eight years but, following the confirmation of Louis van Gaal’s appointment as the team’s new manager, he has decided to extend his contract, which was due to expire next week, by another 12 months. Evra seemed likely to leave after it emerged that United had tabled a bid for Southampton’s England left-back Luke Shaw. But the former Monaco defender has opted to remain for at least the first year of the van Gaal era in Manchester. Evra’s contract extension will be welcomed by the vast majority of United fans, who have taken the 33-year-old to their hearts since he joined the club in 2006. 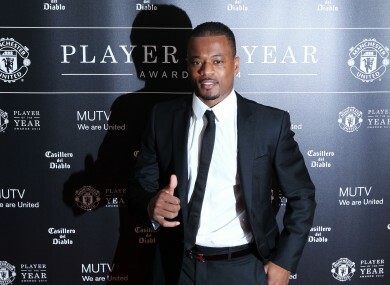 Evra is a popular member of the dressing room too and is renowned for his leadership skills. The former Nice defender, who has played 379 times for United, was one of the few players to emerge with any credit from a terrible season at Old Trafford, which saw boss David Moyes sacked after less than a year in charge as the Red Devils slumped to seventh in the Premier League. Evra also scored a stunning goal to put United ahead at Bayern Munich in the Champions League quarter-finals, although it was not enough to stop his team crashing out of the competition. Email “Patrice Evra signs new one-year contract with United”. Feedback on “Patrice Evra signs new one-year contract with United”.